Amphenol ICC Minitek MicroSpace Crimp-to-Wire connectors’ unique design enables LV214 Severity-2 and performs at 1.8, 1.5 and 1.27mm pitch. 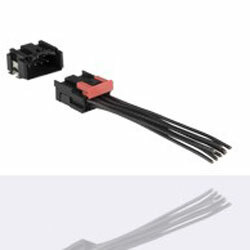 Available from TTI Europe, the connectors are supplied in single and double row versions, with top and side latch configurations. Rated up to 100 mating cycles on Gold/GXT contacts and allows current rating up to 4A per contact. LV214 Severity-2 compatibility makes it perfect for automotive applications. Furthermore, this vibration-tolerant product is characterised by its high connector locking strength of more than 75N. The connectors are suitable for automotive applications and harsh environments.